Sailor Moon is one of the most famous faces in manga and anime. Years ago, the anime used to be aired on Cartoon Network. Like many, I watched it dubbed in English, for it was originally in Japanese and that was the only way I ever knew to watch it at the time. Unfortunately, the final season wasn't aired for English-speaking countries for a few different reasons you can read about here. In my opinion, Sailor Moon's time on English television was cut too short. Even now, I miss it, and I know I'm not the only one. As many fans of Sailor Moon already know, the manga is finally being reprinted. Years ago, I started looking for the manga and found that it could get expensive as it was out of print, and at the time even finding them used was a bit difficult. Oftentimes, I ran into Japanese editions (I don't speak Japanese, so this was a problem). But, with it being reprinted, my love for the series has awakened once again. Well, I should say it resurfaced; I never stopped loving it. One thing I've always been aware of is that every single thing we experience, no matter how insignificant it may seem, will leave a mark in some way or another. Everything. The books we read, the shows we watch, the music we listen to... These things affect us. They influence us in some way or another. Even before now, before this love for Sailor Moon has resurfaced, I knew that Sailor Moon influenced me in more ways than one. First of all, Sailor Moon sparked my interst in astronomy. Obviously, this series uses astronomy in fictional ways, but how could it not catch a child's interest? Soon, I grabbed my dad's books on the subject (he loves astronomy as well, which is probably another factor that contributed to my love of the universe and its mysteries) from the shelves. At age four, I didn't understand many of the words used in these books, but that was never my concern. I just liked the pictures; I thought they were beautiful. In fact, I still think they're beautiful. Ever since I could work a remote, I'd go to the Science Channel to watch documentaries dealing with astronomy. I still do. And let's face it, without Sailor Moon, would I get emotional at the fact that Pluto is no longer considered a planet? No, I wouldn't. But I watched Sailor Moon as a kid, and as I watched, Sailor Pluto became one of my favorite characters. If I could be her, Sailor Moon, or Sailor Mars for a day, I'd be happy. So in my world, Pluto is a planet and always will be. Though I tend to favor some over others, the Sailor senshi in general are a group of badasses. Pretty Guardian badasses at that! You gotta love the girl power in this series. But more specifically, I can relate to a lot of the Senshis' defining idiosyncrasies. I can see myself in all but three of them and admire them all. Sailor Pluto is one I wish I could say I had something in common with, but I'm not sure I can. I've always felt some sort of connection to this character... However, this may be the leftover effect her character left from when I was a kid, when I wanted to be her. But throughout my life, I've been able to relate to the general characteristics of Usagi (Sailor Moon), Rei (Sailor Mars), Ami (Sailor Mercury), Makoto (Sailor Jupiter), and Hotaru (Sailor Saturn). Speaking of Hotaru Tomoe, her story is one of my favorite parts of the manga and anime. 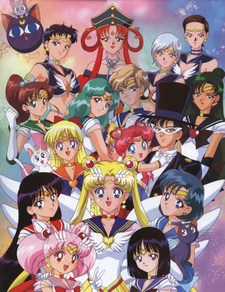 When I used to watch the anime on TV, I typically ended up watching the third season, Sailor Moon S, and had a couple of tapes of episodes from that season. 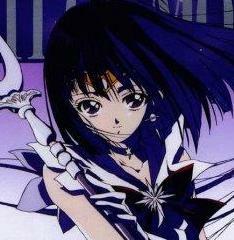 I had always been mystified by Hotaru's story of becoming Sailor Saturn, I watched the tape over and over again. But I never saw the ending. I never knew what happened until a few years ago, when I looked it up. I didn't know about Mistress 9 or Pharaoh 90, or that she would be part of the Outer Senshi... and I don't know why that strikes me so. For whatever reason, this became so important to me, to find out what happened to such a beloved character. As I could relate to her shyness, maybe I thought that I needed to find that last piece for myself. As if her story had become part of mine, had affected me forever. It may sound ridiculous... But that's the way it is. Though I loved the Inner Senshi, I was always so intrigued by the Outer Senshi. They were darker people dealing with darker situations, and I loved that aspect. Their contrast with the lighter energy shown by the Inner Senshi made me appreciate both types of characters: the serioius and the humorous, the dark and the light. Of course, though the Senshi had much to worry about, there was still room for love interests. Sailor Moon's love interest, Tuxedo Mask, definitely caught my attention. Some may think this odd, but he was my cartoon crush. Just look at his picture. Doesn't the word 'dreamy' come to mind? Anyway, his character also had a strong influence on me. Ironically, he somewhat resembles the Phantom from Phantom of the Opera, which would later become my favorite musical. Even as I've grown, I like characters with his mistique and characters that remind me of him and his relationship with Sailor Moon. By the way... Why does the English dub say that Uranus and Neptune are cousins when they are obviously lesbians? Why? It would have answered so many questions I had as a kid. Anway, even the Moon Cats had an adorable relationship! Artemis and Luna were so cute together. One day when I was five, a black cat appeared on my porch, and I knew I'd have to name this cat Luna. I still said that when I found out the cat was a boy. Since Sailor Moon led me to love astronomy, I knew that 'luna' referred to the moon. In my five-year-old mind, the moon was a big rock in the sky and had no gender, therefore it was okay to name a boy Luna. I don't regret that odd decision, strangely. As I ramble about my life as a Sailor Moon fan and talk about Moon Cats and badass Sailor Senshi, one may wonder what the actual purpose of this show is. It's about the strength of love and frienship, individuality, the beauty of the universe, and liberation. Those are pretty good influences to have at such a young age, aren't they? Because obviously, the effects last forever. Years later, I am looking up information on the parts of the story I didn't see as I kid, that last season that was never aired in English-speaking countries. I am buying the new manga and looking into buying the DVDs of the anime I loved so dearly when I was little. If this love for the series hasn't faded with time already, I doubt it ever will. And that makes me happy.